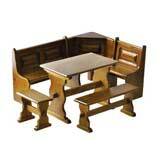 This dollhouse kitchen set is wooden with a walnut finish and white counter tops. 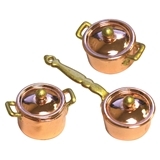 The dollhouse kitchen furniture appliances are a combination of white and "stainless". The doors and drawer work, and refrigerator has interior shelves. If you would like to connect the upper hutch to the range, simply apply glue* to the back edge of the stove's burner unit. Put the hutch unit flat on a piece of wax paper and set the range unit on top of the hutch. Loosely apply a piece of masking tape vertically over the pieces, then weight it and let dry. *We successfully tested this process using #5515 Omni-Stick. I love this set! You can arrange it in so many ways. The detail is perfect, with tons of counter space for all your favourite minis. I was disappointed in this. It had gouged spots on the counter tops. The cabinets and the refrigerator are of a lesser quality than I had expected. on 1/30/2011 You can't beat the price! Without a doubt, the best set in my entire house, and by FAR the most expensive. You get what you pay for here. 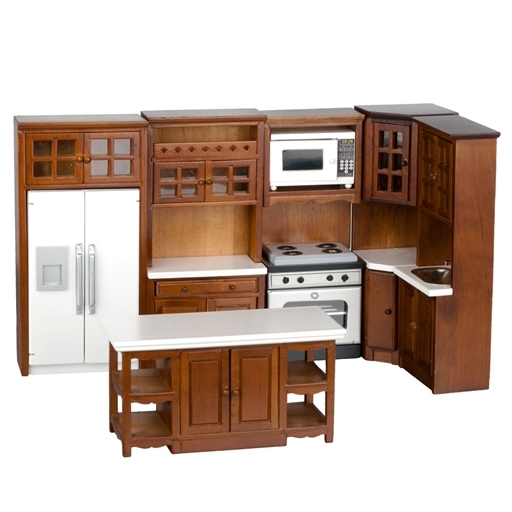 The level of detail and beauty with this kitchen set will have you in awe for days on in. Worth every last sent I spent on it , and miniatures offers it at a great discount. Definitely pick it up while you can!